The CS692 HD USB KVM Switch links two HD-enabled PCs or devices to a single USB keyboard, USB mouse, and HD display console. The CS692 Switch takes a giant step forward from prior cable KVM models in the Petite series, by offering full HDMI functionality, USB 2.0 peripheral sharing (via a USB hub attached to the USB mouse port), and a firmware upgrade function that allows you to keep up with latest available versions. 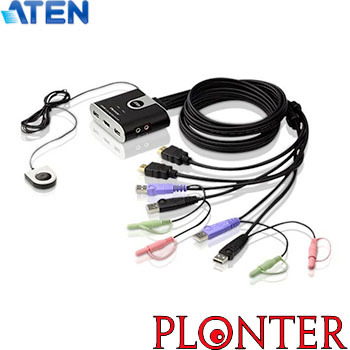 [table][tr] [td][img]https://www.plonter.co.il/graphics/product_images/100x100/CS692.jpg[/img][/td] [td]KVM - KVM HDMI [url=https://www.plonter.co.il/detail.tmpl?sku=CS692][b]CS692[/b] - [b]ATEN[/b] - The CS692 HD USB KVM Switch links two HD-enabled PCs or devices to a single USB keyboard, USB mouse, and HD display console. The CS692 Switch takes a giant step forward from prior cable KVM models in the Petite series, by offering full HDMI functionality, USB 2.0 peripheral sharing (via a USB hub attached to the USB mouse port), and a firmware upgrade function that allows you to keep up with latest available versions.